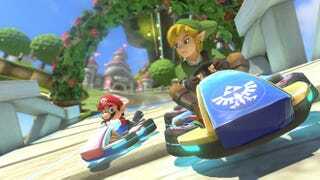 Didn't like that stupid Mercedes DLC for Mario Kart 8? Please understand. Nintendo had something cooler coming later. UPDATE: We've now got more details from Nintendo. The packs (the first due in November, the second in May 2015, which is an absurdly long time away) will cost $8 each, or you can get them both for $12. Considering the amount of stuff you're getting (six new characters, eight new cars and 16 new courses increase the game's roster by 50%), that's a pretty good deal. A listing on the company's UK page has revealed two upcoming DLC packs for the game that add Link, Tanooki Mario, Cat Peach and Animal Crossing characters as racers, let you choose an F-Zero car and bring new tracks, including ones set in the worlds of Zelda and Animal Crossing.